Read Nettie’s story in Robyn’s words. She had one dog left, a German Shepherd mix named Blue — and he was despondent over the loss of his two companions as well. 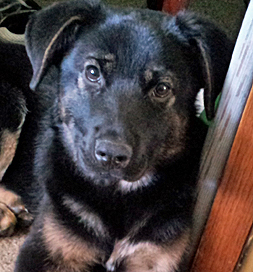 Nevertheless, she began looking at Petfinder and saw a five-month-old Shepherd mix named Sage. Out West Pet Rescue in Prosser, WA, had listed her on Petfinder. Like many adopters who add new four-legged family members while they’re still in mourning for a beloved pet, Robyn admits that she may have needed Nettie more than Nettie needed her. The adoption has worked for all of them, Blue included.